it was a lovely sunny morning with the celsius hovering around thirty plus, we were looking so much forward to the hot weather, because the weather in the czech republic was more on the cold side. well, we walked out from the airport hall with a big smile, and in no time we were seeking information about what bus, from a long line of buses near by, was ours, from a tourist guide girl.. yeah, we were smiling, but she did not, and she seem to be annoyed and not very helpful, so i told her, that she may consider not working with people if she found them annoying. i do not remember how she reacted, i think she did not. the beauty was, that on our way to the beach was an excellent little corner shop with plenty of cheap, fresh and tasty fruit for sale, yes, they had fresh strawberries first and second grade, i got always the first, same with the cherries, apricots were not the best, but the oranges, grapefruits and watermelons were heavenly. and for dinner (from six to eight) there was watermelon always very sweet and yummy, like all fruit i had the honour to eat. and whole uncut oranges, we were permitted to take with us to our rooms, so me and mum brought every night enough oranges for freshly squeezed orange juice we made some time after dinner on our hand orange juicer we always take with us on holiday. and those juices were always so yummy, we drank it heartily, giving thanks to the sun, which we truly both could feel in the fresh juices and the whole fruit. one night, at dinner time, mum brought some part of some dead rotting animal, seasoned and cooked in the kitchen, and i could immediately smell the stench of rotten old meat, so i said to her that the corpse is stinky, but she, as a meat muncher, could not smell it, did not believe me, and she ate that mad stuff. she woke up in the early morning hours, very sick, i slept through it and when i woke up, around eight, she, the poor thing was crying out, telling me she was going to die. i knew, that she got poisoned by that rotting corpse, but i kept it to myself, as there was no time for education, but for compassion, so i told her that i am sorry she had to suffer so much, but i was sure she would survive it and live, especially if she gave food a rest, she said that only the thought of food was making her sick. she spent all day without energy in bed and she got severe diarrhea. the next day she felt much better and straight away got in to a breakfast, having coffee and bread, boiled egg and cheese, but after she had eaten just a little bit, then she went for the orange grapefruit watermelon plate and she almost ate it all. soon after breakfast we went for sun and water bliss in our hotel yard, and in about one hour mum was rushing in to our room and when she returned, she told me that she threw up about 4 liters of stuff, in to a big bathroom marble sink. so i asked her to spare me any details, i do not enjoy listening to such stuff, so she stopped, and i noticed she finally looked much better, so i told her and she said that she is feeling well again, and since then she had more of the fresh fruit and veg than usual, and she cut down on meat a lot. but still way too much of bread, cheese and eggs. i forbid her to eat any butter or margarine, luckily she obeyed me, i told her that she had plenty of fat in eggs and cheese. even her doctor told her that she must cut the fat, so that is why she took me also more seriously on the fat issue, and truly reduced her fat intake. my mum always loses some kg's while we are holidaying together. she naturally eats more fruit and veg when she is with me, and she also loves fruit on the hot days which she tolerates very well. this time she lost 4kg, but when we have our own meals she looses 5 to 6kg. in such times she eats mainly fruit, much less of veg and very small amount of bread, and almost no meat at all, she usually has a tiny bit of some stinky salami and one tiny tin of poor dead fish. we also drink raw fresh juices daily. i drink and eat raw fresh fruit only. and we had a great time, we relaxed a lot by the water and in the sun, we went for nice walks around flowery and fruity parks, and we even managed to buy some decent stuff, despite all of the touristy kitschy stuff everywhere. mum bought a summer cotton dress for me, coffee, spices and some turkish sweets for herself and family. i didn't buy a thing. the first day i had a nice swim in the sea. - even though it was visible to my eyes, that the water was not very clean at all. well, i was already in and could not resist to swim which i love so much. so i swam mostly under water as usual, and already in the early night i got the corners of my eyes full of puss, which built up fast again after i cleaned it. well, i was not very surprised, this is how my eyes react when i swim or bathe in polluted water, and because that happens rarely i tend to forget about it. truly it was my first and last swim on the famous kleopatra beach on the turkish riviera and i had swims in the pool in our hotel yard, which to my delight was chlorine free and never very busy, so most of the time i had the pool just for myself, because i always wait until the others leave the water, so i did not have to watch out for others while swimming and i could swim with closed eyes, freely where ever my moves took me, all i had to look out for were the pool walls, so i had to pay some attention to the space i was in. luckily i took with me a bit of aloe vera leaf, and it helped me to heal my infected eyes fast, on the third day they were clean again, it was a very strong and unpleasant infection. so even though they have so much yummy fruit, - turkey by sea no more! even so, I was reluctant to return to the cold czech summer. on our way back to prague, still in turkey in the airport hall, me and mum arrived to a very long queue, we were last because i walk as fast as a snail, so i made myself comfy and sat down on the clean floor, waiting for the queue to move forward. shortly after the tourist guide girl, who was not very pleasant that i commented on earlier, appeared.. and she was smiling and reminded me that she was the one that i had told her what i thought about her annoying service, and she apologised and said that my comment helped her to look at herself more closely, she had not been aware how she treated her customers, and she took me and mum to the front of the queue and organized for me a wheel chair, so i did not need to walk the long airport hallways. usually i organise this service by myself. so i was truly happy, not because we didn't have to wait in the long queue, but mainly for the lovely tourist guide girl. we even had time for a very nice chat. 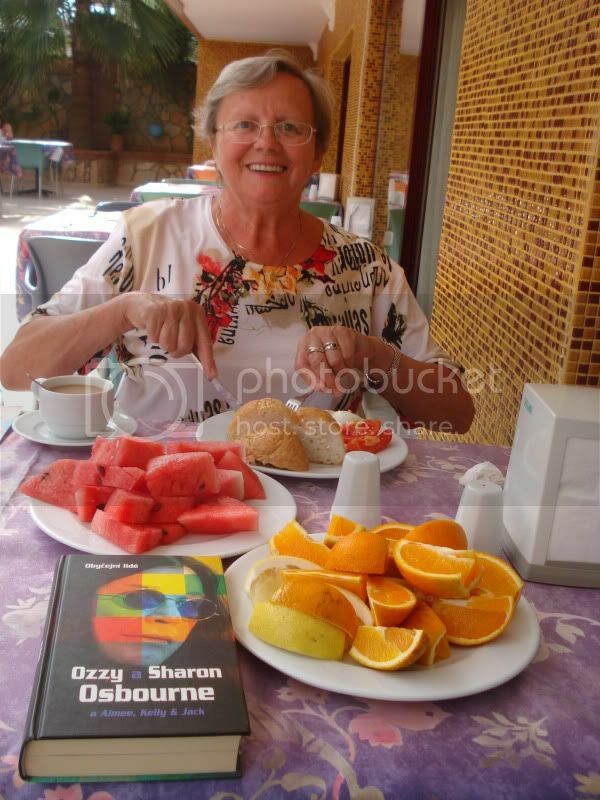 my mum at breakfast time on the turkey holiday, the fruit is all mine, i had always 3 fully loaded big plates of oranges, grapefruits and watermelon. always fresh and very yummy. mum had some fresh fruit as well, usually after her toxic "food". i borrowed and read the ozzy and sharon osbourne book. Thank you for this great write-up! I love all the details and I am always learning something from you. The picture of your mum is so sweet. She looks adorable in spite of the junk she is eating. It is rather odd and frustrating that we can't convince our own families to follow along. It's also a beautiful picture because of the gorgeous fruit plates! Thanks again for sharing so much. . .I love to read you. I´m sorry for writing you, i know you don´t know me. contact you for a long while, but i didn´t find it so i create a blog so i could write you. I am Isabel, I am 18 years old, and I am Colombian, but I live in Mexico. but I know you are one of the few persons that i´ve seen that is a trully ethical fruitarian. I am massage therapist, I know I am very young, but I meet massage therapy because I heal myself emotionally from a long period of destruction, anorexia, depression.... and the way i use massage was by touching myself, making pace with my body and my soul, accepting what I am and what I came to do to this world... giving me and mother earth unconditional love. all my life I had love fruit. And every time i can, i eat only fruit. i have seen in your blog that you only eat after 4 pm more a less... you dont have breakfast? eating just fruit, can i get more fat? but i was embarrassed to ask you, even you dont know me. i admire you, you are a teacher for my heart and my path. i love your pictures, your plants, your fruit trees.... your seas... your love-mango..your lovely mother..
i´m sorry because of my english, but i didn´t write it a long time algo.. I send you all my love and light for your path and the ondes you love.. thank you for reading me, thank you for your teachings, thank you for living the way you live, for loving fruit and making sweet your life and the ones you love. i really admire your path. thankyou, i am pleased you enjoy my blog. thankyou for your long sweet note. i have breakfast when i am hungry, mostly around midday, at times around 4pm. i never eat straight after waking up. breakfast is the first meal of the day, it does not mean it is always an early morning meal. raw fresh fruit is always a winner, no matter what is wrong with us. What an enviable fresh fruit plater you have there! When in Britain it is cold and wet they go on a vacation to Turkey as it is sunny whole year round. Hotel rates are cheaper and everything is pretty Decide month is included. You can vacation in luxury hotels very cheap amount. thank you for following my blog and enjoin it. yes, you are right. thank you for sharing and visiting my blog.